Once part of a complete Bible, this manuscript belonged in the middle ages to the Franciscan convent (Greyfriars) in Canterbury. 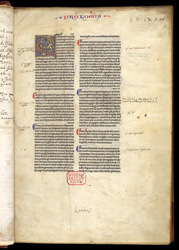 It has the standard set of explanatory texts (glossa ordinaria) written in the specialized page design which allowed sections of explanation to be placed next the relevant part of the text. Another set of explanations by a different compiler is written between the lines (interlinear gloss). In this specialised graphic design, the Bible text is written with large letters, the gloss in small, to express a hierarchy of the most authoritative text and the commentary on it. The layout and the glosses were mainly for students of theology and theologians. It was a way of maintaining a correct or orthodox body of explanation. Often a prologue by the compiler of the gloss, Walafrid Strabo (died 849), preceded the biblical text. The names or abbreviated names at the beginnings of paragraphs (Aug. for Augustine, Bede) indicate the sources from which the prologue was taken.